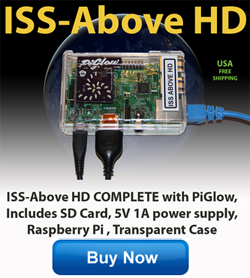 Back the Kickstarter and you can get your own ISS-Above! ISS-Above has been successfully implemented at numerous locations throughout the world (Thank You Beta Testers) now is the time to move this to the next level. My plan and wish has always been to use the ISS-Above as a means to spread greater awareness and appreciation for space/science/astronomy throughout the world. Kickstarter offers a means to do that by providing an opportunity for you to back great project and to get one of these devices for yourself. Although ISS-Above is still in Beta development we already have units in the USA / UK / The Netherlands / South Africa and Australia with further sites in development. This map will give you some idea of where all the ISS-Above devices are currently located around the world. Thank you to all the Beta testers who have helped so far.